Did you know that February 19th is one of those foolish food holidays? That's right, apparently it's National Chocolate Mint day. Good thing I have just the right treat for the occasion today. 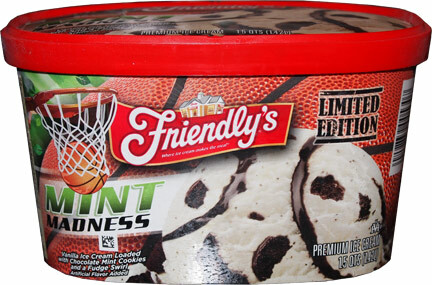 This is Friendlys MINT MADNESS and you would think there would be some kind of copyright violation here somewhere, especially with the strong basketball theming of the container, but whatever, it's the flavor that we are after. Look more familiar now? Yeah, Friendly's is attempting to produce another Thin Mint clone. 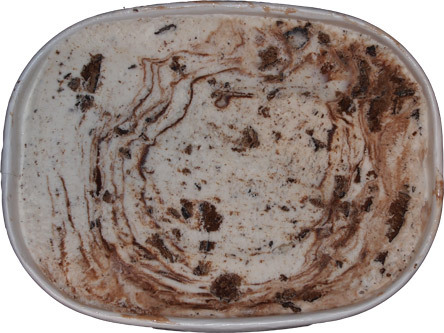 I mean, quick go look at the Edy's (thin mint) Review and you'll see it's rocking a very similar chocolate covered cookie. There are going to be two big differences here though. The first difference is obvious and that's the much more prevalent fudge swirl. It completely changes the flavor profile to a distinct chocolate mint composition (ding ding ding, we've got our food holiday tie in!). The other big difference is the texture. Remember how I said the Edy's flavor was almost too clean? It was a cookie flavor without a cookie vibe. Well, this Friendly's flavor is the exact opposite. 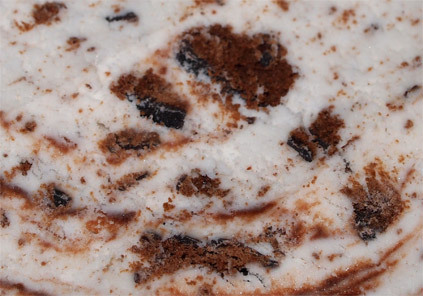 It's has a very complete cookie grit texture to the whole thing, it actually reminds me of a cake shake really. You'd expect the cookie grit when you grab a chunk of cookie, but even when your spoon seems empty of them, you still have that cookie cake texture going on and on. It's funny how very different these flavors have turned out, though funny enough, this has a very similar aftertaste to the Edy's version (which makes sense). I'll admit this one had me confused at first, I was expecting a creamier flavor, but I've settled in and I'm digging this ice cream. It's based around a cookie, so why shouldn't it remind me of eating a cookie? The cookie vibe is so strong that when I'm done, it kind of feels like I've been eating cookies. On Second Scoop: I'm liking this even more on the second try. Now don't pick this up because it's a mint flavor, try it because it's a cookie flavor. You're not going to get a strong mint flavor, and even the swirl tends to be pretty quiet (unless you get the occasional thick burst of it which helps bring up the chocolate factor). No, this one is for the cookies. It's got that cookie grit along with little bursts of cookie shell crunch that help sell this one. I'll give it a thumbs up. Now this is a flavor I can get behind! I'm not a mint choc. chip person so this one seems amazing. Now I just need to find it in the stores! I was at a bigger and better Shop Rite yesterday and couldn't find any of the girl scout inspired flavors by Edys or Breyers...Major bummer!